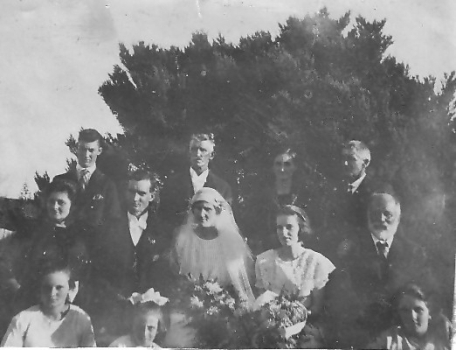 OZIGEN - Australian Genealogy - The wedding of Florence Ann Sheather to Stanley K Pullen. Back Row: 2nd from left - Albert Lindman Middle Row, Left to Right: Elizabeth Lindman née Sheather, Stanley K Pullen, Florence Ann Sheather, Unknown, John Sheather Photograph provided by Janelle Higgins. The wedding of Florence Ann Sheather to Stanley K Pullen. Photograph provided by Janelle Higgins. Use your browser's BACK key if you wish to return to the last page you were viewing. Click on the name below the photo to view the related record.